VBS at Reformation is wonderful experience. Planning for VBS 2016 is under way. VBS this year is planned for June 20-24th. Bible study, hymns, crafts, refreshments, and recreation for children 3 years old to through 8th grade. Experienced, caring teachers and staff provide a safe, enjoyable environment. This coming year we will focus on Jesus' Death and Resurrection. 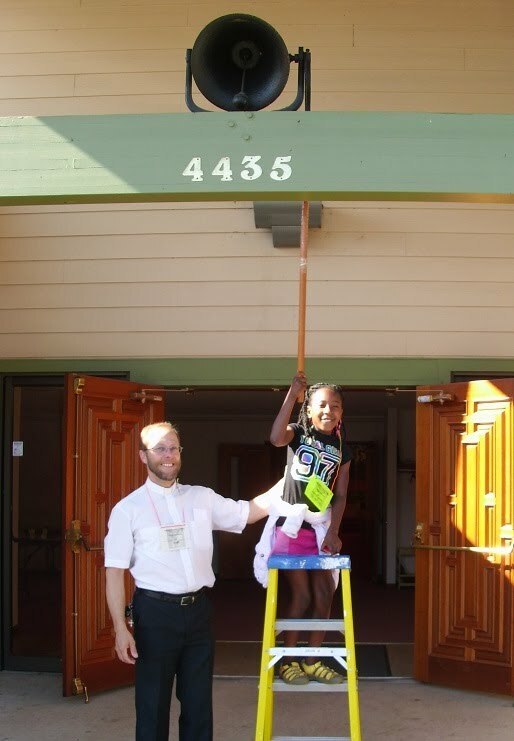 Left: Ringing the bell is a favorite activity reserved for the older students. What can a child expect to experience during VBS at Reformation Lutheran Church? 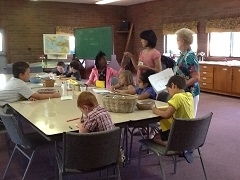 The focus of VBS at Reformation Lutheran Church is Bible study. Our crafts, and songs all reinforce the Bible study. Even free time and snacks are intended to refresh the children’s bodies, so that their minds may learn, and their spirits grow. Everything is intended to foster a respectfulattitude toward the King of Kings, who died so that we can live forever free from sadness. Over all our Bible studies this year were about Holy Week. The children learned the meaning of “Hosanna” (Save now! ), as we studied Palm Sunday and the coming of the Passover Lamb of God into God’s House. Right: Crafts at the last VBS included a simple diarama of Jesus' entry into Jerusalem, a folded cardstock bank that emphasized: "Render unto Ceasar what is Caesar's, and unto God what is God's"; a picture frame to hold a picture of the class and remind the students to love others as God loves us in Christ; and a "Christ is risen!" sun catcher. Wednesday we studied the events of Maundy Thursday and noted that love is not comfortable, but sacrifice. The children learned that, “Maundy” means, “commandment.” Jesus commanded that His people, “Love one another.” He also commanded that we be humble like He is humble. Finally, He commanded us to “Do this,” in regard to receiving His body and blood in the Holy Supper. 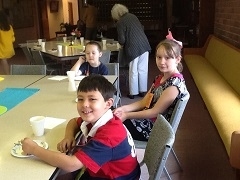 The children learned that the Holy Supper is the fulfillment and continued celebration of the Passover. We talked about the custom of feeding hand to mouth, and what that means. We also noted that Jesus kept showing even Judas how much He cared about him, even though Judas was betraying Jesus. Left: A light, healthy snack energizes the brain for learning. Right: A brief play time expends pent up energy and clears the mind as well. On Thursday we studied the events of Good Friday. We saw how Barabbas, a man whose name means, “Son of the father,” was set free even though he was a criminal, while Jesus who is the Son of the Father died even for his sins. We considered that Jesus never denied false accusations made against Him, and always affirmed trued statements that were made about Him. In this way He was judged guilty of our sins. On Friday we looked at the Resurrection of Jesus, what it means, and how it changes life for us. We have hope in the resurrection, and theGospel is preached because Jesus rose. The resurrection also shows the historical validity of theChristian faith, unlike other belief systems include beliefs that claim to be scientific, but are not. At Reformation we teach children hymns that build up their faith, and that will be meaningful throughout their lives. Yes, we sing some of the “little ditties,” as well, but that is mostly just to refresh their minds as they absorb some rather challenging hymns. Song time includes memorizing, and learning the meaning of the hymns. The hymns that are chosen reinforce the lessons each day and the over all theme of the week. This year we had some hymns that are very somber, as well as some that are very joyful. That is in keeping with the rhythm of the Church Year, and various facets of the Christian faith. The focus of Lutheran Hymnody is always on the forgiveness of sins in through faith in Christ. Therefore the hymns focus on Jesus, sacrifice for us. The hymns we specifically worked on learning this year are: Lamb of God That Takest Away the Sin of the World; Rejoice, My Heart, be Glad and Sing; The Death of Jesus Christ Our Lord, We Celebrate with One Accord; Oh Darkest Woe; Christ Jesus Lay in Death's Strong Bands, and Christ is Arisen. We encourage parents to take time to read through hymns in the song book with their children, and talk about the meaning of the hymns. By the end of the week, the children usually know a verse or two of these hymns. On the back of the song book are prayers for daily use. Left: Pastor Brockdorf talks with a class about the meaning of the hymn of the day. Matthew 22:37, 39 Love the Lord your God with all your heart, with all your soul, and with all your mind. Love your neighbor as yourself. Romans 6:4 We were buried with Him through baptism into death, that just as Christ was raised from the dead by the glory of the Father, even so we also should walk in newness of life. John 20:21-23 “As the Father has sent Me, I also send you.” And when He had said this, He breathed on them, and said to them, "Receive the Holy Spirit. If you forgive the sins of any, they are forgiven them; if you retain the sins of any, they are retained."